The season or period of singleness is not a taboo neither is it a curse, but it is a transit season of self-discovery and potential manifestation to a certain level. however, a time comes in the life of an individual when he or she should leave to cleave to a partner in matrimony so as to reach fuller potentials in life. when the realization of cleaving to a partner becomes a mirage or is hyper-delayed, then certain factors which could either be acquired, self imposed, self inflicted or externally imposed are responsible. 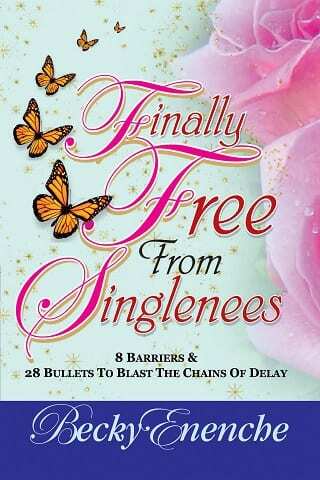 In this book, Dr. Becky Enenche exposes the causes of chronic singleness to you and also equips you with the knowledge of sure principles that will empower you to blast off the chains of delay and get you established in marriage.